A perfect blend of pointy paws in a coat of fur, Baloo is an affable display typeface, available in ten Indian scripts along with a Latin counterpart. A distinctive heavy spurless design, Baloo has a subtle tinge of playfulness and all the bare necessities of type. Carefree yet confident, warm yet entertaining, sprightly yet intelligible, Baloo infuses life everywhere it goes. The Baloo project develops ten separate fonts with unique local names for each of the nine Indic Scripts. 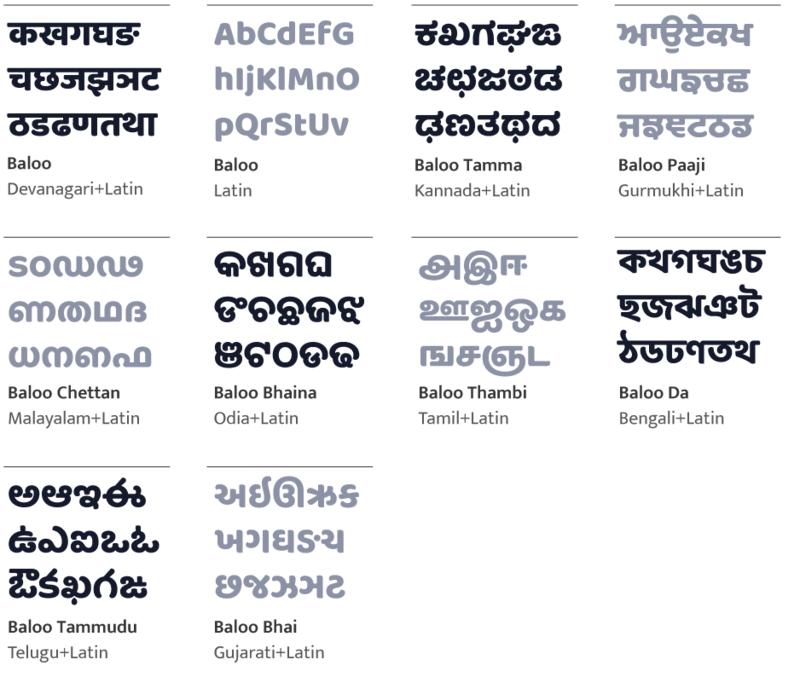 Each font supports one Indic subset plus Latin, Latin Extended, and Vietnamese. Most of the fonts in the Baloo family are libre licensed.